This book is an attempt, now made for the first time, to explain to an English-knowing reader an undoubtedly difficult subject. I am therefore forcibly reminded of the saying, “Veda fears the man of little knowledge, since injury may be received from him” (Bibhetyalpassutad-Vedo mamayam praharisyate). It is natural, given this difficulty and the mystery which surrounds the subject, that strangers to India should have failed to understand Mantra. They need not, however, have then (as some have done) jumped to the conclusion that it was “meaningless superstition.” This is the familiar argument of the lower mind which says “what I cannot understand can have no sense at all.” Mantra is, it is true, meaningless to those who do not know its meaning. But there are others who do, and to them it is not “superstition.” It is because some English-educated Indians are as uninstructed in the matter as that rather common type of Western to whose mental outlook and opinions they mould their own, that it was possible to find a distinguished member of this class describing Mantra as “meaningless jabber.” Indian doctrines and practice have been so long and so greatly misunderstood and misrepresented by foreigners, that it has always seemed to me a pity that those who are of this Punyabhumi should, through misapprehension, malign without reason anything which is their own. This does not mean that they must accept what is in fact without worth because it is Indian, but they should at least first understand what they condemn as worthless. When I first entered on a study of this sästra I did so in the belief that India did not contain more fools than exist amongst other peoples, but had on the contrary produced intelligences which (to say the least) were the equal of any elsewhere found. Behind the unintelligent practice, which doubtless to some extent exists amongst the multitude of every faith, I felt sure there must be a rational principle, since men on the whole do not continue throughout the ages to do that which is in itself meaningless and is therefore without result. I was not disappointed. The Mantra-sastra, so far from being rightly described as “meaningless superstition” or “jabber,” is worthy of a close study which when undertaken, will disclose elements of value to minds free from superstition, of metaphysical bent and subtle-seeing (Suksmadarsin). 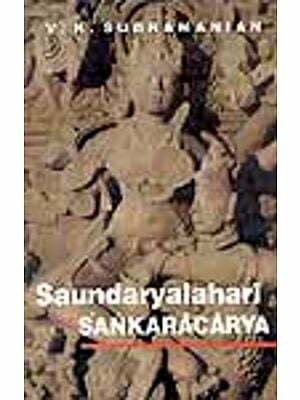 A profound doctrine, ingeniously though guardedly set forth, is contained in the Tantras of the Mantra-sastra or Agama. This is an auspicious time in which to open out the secrets of this Adhyatmika science. For here in this country there has been a turn in the tide. The class of Indian who was wont to unite with the European critic of his Motherland in misunderstanding and misrepresenting. Her thoughts and institutions, is to Her good, fortune, gradually disappearing. Those who are recovering from the dazzle produced on its first entrance by an alien civilization are able to judge aright both its merits and defects as also to perceive the truth of the saying of Schiller: “Hold to your dear and precious native land; there are the strong roots of your strength (Ans Vaterland ans teure schliess dich an. Da sind die starken wurzeln deiner Kraft. )” Again in the West there is a movement away from the Materialism which regarded that alone as “real” which is gross sensible matter; and towards that standpoint whence it is seen that thought itself is a thing which is every whit as real as any external object. Each is but an aspect of the one conscious Self whence both Mind and Matter proceed. This self or Cit is the Soul of the Universe, and the universe is Cit which has become its own object. Every being therein is Consciousness, that is, Cit manifesting as the multiple forms of Mind and Matter which constitute the universe. This Western movement is called by its adherents “New Thought,” but its basal principles are as old as the Upanisads which proclaimed that all was Feeling Consciousness (Cit), and therefore what a man thought, that he became. In fact thought counts for more than any material means whatever. I am not however here entering upon a general defence of so immense a subject, for this cannot be compassed in a work such as this. In any case — and this is what I am concerned to show— the Mantra Sastra is not the mere senseless rubbish it has been supposed to be. 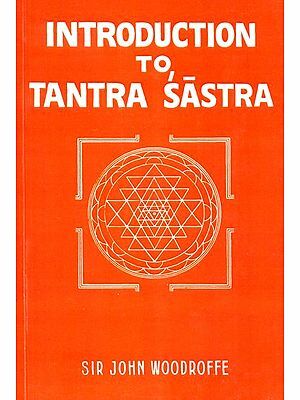 This book is, as the sub-title States, a Collection of Studies in, or Essays upon, particular subjects in the Mantra-Sastra, a term which is commonly applied to the Tantra-Sastra. It is practically composed of two parts. After Chapter 1, which deals with the “Word,” Chapters 2-9 treat of the Principles of the general doctrine of Sabda. I am much indebted in the preparation of these Chapters to my friend, Professor Pramathanatha-Mukhopadhyaya. 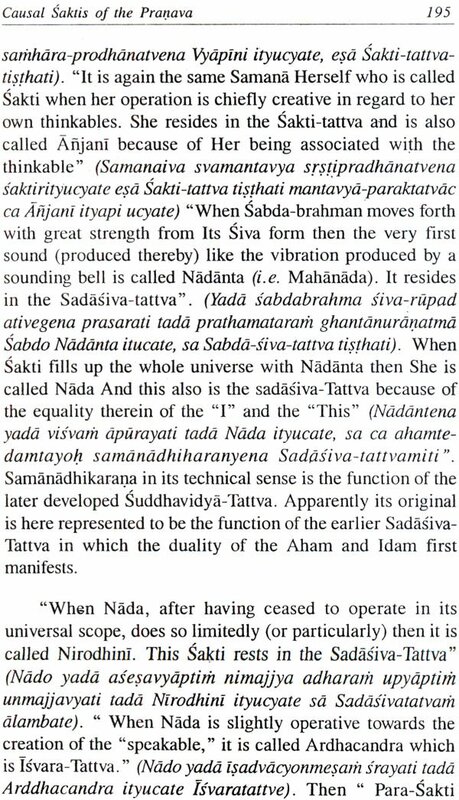 Chapters 10-21 are elucidations of some subjects in the Tantra-Sastra which adopt the Mimamsa doctrine of Sabda with some modifications to meet its doctrine of Sakti. Chapters 12, 28 and 29 deal with the Mantras “Om” and the Gayatri. 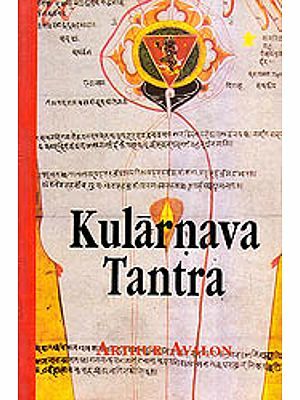 An understanding of such terms as sakti, Nada, Bindu, the Causal Saktis of the Pranava, BIjamantras and so forth, is essential for, those who would understand the Sastra in which they appear Hitherto knowledge of these matters has been confined (where it exists at all) to the Gurus and Sadhakas. This does not mean that my information has been gathered from oral sources only. On the contrary, the substance of it may be found in the Tantras. These are however generally unknown. The ‘definitions must be sought for in many Sastras. When found they must be explained by the aid of general Sastric knowledge and of Upasakas who possess the tradition. As regards technical terms I refer my readers to other .books which I have published, in particular to “sakti and Sakta, The Serpent Power,” and the volumes of the series called “The World as Power” describing the chief concepts of Indian Philosophy and Religion. 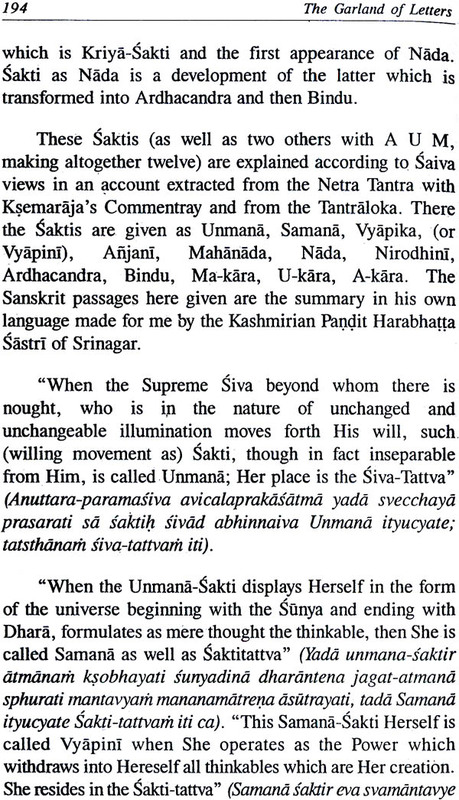 Chapters 10-21 and 14 are reprinted from the Journal the Vedanta-Kesari. 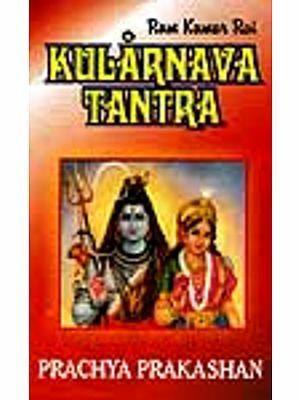 Chapters 22-23 on “Om” and the “Necklace of Kali” appeared in East and West, and Chapters 28-29 on Mantrasadhana and the “Gayatri” in the Introduction to my edition of’ the Mahanirvana Tantra, which is now superseded, as regards the Introduction, by the fuller account of the Tantras and Tantrik ritual given in my volume, sakti and sakta,” and as regards the Text, by another and more correct edition which I have in preparations. Chapter 30 on the “Gayatri as an exercise of Reasoning” is a reprint of a paper read by me before the Indian Rationalistic Society at Calcutta and has been previously published in its Bulletin. Ten of the papers dealing with general principles were delivered by me in 1919 as Extension Lectures at the instance of the National Council of Education, Bengal. As I write the concluding lines of this preface heard by the ancient and desolate Temple to the Sun-Lord at Konaraka in Northern Orissa, a continuous rolling sound like that of the Mahamantra is borne to me from afar. I heard the same sound many years ago at the Pemiongchi monastery when some hundred Buddhist monks rolled out from the depth of their bodies the mantra Om. Their chant then suggested the sea, as the sea now suggests the Mantra. Here where the sound is heard are green woods, bushes of jasmine, cactus in bloom and the rose and yellow of the Karavira and Kalika flowers. Travelling however whence it comes some two miles seaward, the eye surveys a wide wild waste of land, with here and there sparse clumps of Ketaki, stretching from the world famous Temple of the "Lord of the Universe” in the south to the Golra jungle on the North. On the Eastern edge the surf of the Bengal Ocean in great waves, marbled with foam with creaming crests, whipped into filmy vapour by the wind, ceaselessly beats upon lonely shore. The waves as all else are Mantra, for Mantra in its most basal sense is the World viewed as — and in its aspects of— sound. But as I have explained in the Text we must distinguish between Natural Name in it’s pure sense as the sound of the constituent forces of a thing and the sounds made by the thing when so produced. All ands and therefore movements form the “Garland of Letters,” which is worn by the Divine Mother, from whose aspects as Om or the General Sound (Samanyaspanda) of ± first creative movement all particular sounds and things some. For all things may be rendered in terms of sound. The Universe is movement The Letters are the sound of particular movements. These are audible as the gross letters which Kali, the Source of movement, wears as a garland round Her neck.